These scrumptious, buttery, cheesy biscuits were the goal, but it took a couple of tries and a bit of heartache to get there. It was humbling, making a bad biscuit. So far, I had managed to elude the problems that so many novice biscuit-makers complain about. I suppose I got a little cocky. I blame it on “New Kitchen Syndrome.” You know that stage where everything has been unpacked and stowed away, the counters have been cleared, and you should easily, at least in theory, be able to get back to baking again. Except you can’t remember where you put the measuring spoons and the ingredients you need are all in the very back of the cabinet. It is harder to do just about anything you want to do and can make you quite grumpy. Eventually, I got to this. We are still talking about these Cheddar Dill Beer Biscuits. Buttery, cheesy, and slightly tangy biscuits made with beer instead of buttermilk. They were incredibly delicious and I will tell you how to make them in a moment. First, though, we had this. They look pretty good, don’t they? Tall, flaky with a crisp slightly browned exterior. These should be wonderful. I am going to be honest and tell you they were not! They were incredibly dense and heavy and dry. They were edible but only with vast quantities of butter or completely smothered in soup. So what went wrong? Two things. I forgot the cheese, for one. I was so mad when I realized, then kind of relieved that good cheese had not been wasted on this sub par biscuit. Second, not enough beer. Seriously, I believe the liquid to dry ratio was off, not allowing the beer to connect with the leaveners and help them work their magic. I was so concerned about making the dough too sticky that I made it too dry. Well, with this little lesson under my belt I set out to make it right. I started again using the same ingredients, just with a little more beer. Despite the fact that I had trouble with the recipe the first time around, it is only a slight variation on my favorite buttermilk yogurt biscuit recipe. Self-rising flour, a little sugar, part shortening and part butter (frozen and then grated). I added grated sharp cheddar cheese and dill, along with a bit of black pepper. 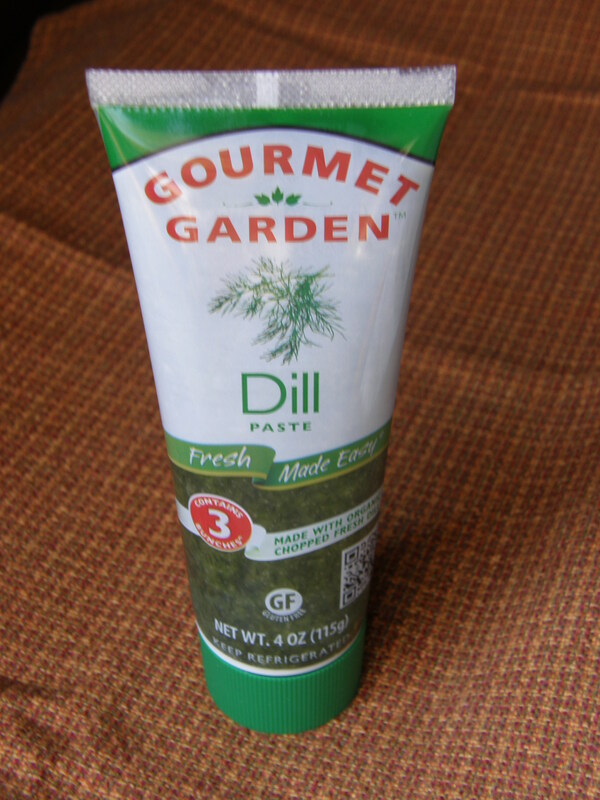 Because I did not want to waste a bunch of fresh dill, I got a paste from the produce department. Have you seen this before? It worked really well. I mixed it in with the beer before adding it to the dry ingredients. Don’t be afraid to be a little heavy-handed with dill. I have found that it is one herb that can get lost if you don’t use enough. It is also a terrific compliment to the cheddar cheese. The dough was a little sticky but still held together pretty well. I put the cut out biscuits pretty close together. They rose nicely and joined together just enough to keep the sides moist. With a few minutes of baking time to go, I took them out of the oven, brushed them with butter, and sprinkled them with sea salt and a touch of fresh ground pepper. Then I put them back into the oven for a few more minutes. Yes, that is a Yazoo beer – brewed in Nashville! Click on the photo for their site. They broke apart perfectly and were thoroughly delicious with the slight amount of pepper and perfect melding of cheddar and dill. No additional butter was required and these definitely did not need to be smothered in soup! I felt completely vindicated. Here is the recipe. Don’t let my initial failure scare you off. These really are easy and so worth it when you get it right! Mix the first three dry ingredients. Add Crisco to dry ingredients and rub with your fingers to break the Crisco up into small, pea sized pieces. Add grated, frozen butter to dry ingredients and stir to coat butter pieces with flour mixture. 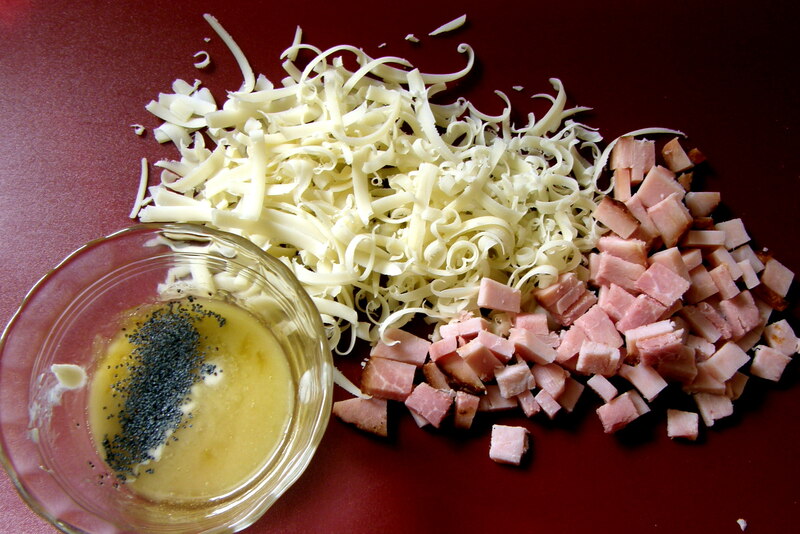 Add grated cheddar cheese to dry ingredients and stir to coat cheese pieces with flour mixture. If using fresh dill, then add it to the dry ingredients and stir. If using dill paste, mix with the beer in small bowl or measuring cup. Make a well in the center of the dry ingredients and add the beer. Mix quickly with large spoon or hands, turning bowl and gently scooping the dry ingredients into the wet. Add more beer, if needed, to make dough moist but not too wet. It will be somewhat sticky. Sprinkle flour onto countertop or pastry board. Dump dough out of bowl onto flour. Sprinkle flour onto dough and rub onto hands. Knead a few times. Press dough together and flatten to about 1/2 inch. Fold dough in half. A pastry scraper can be really helpful here to lift up the dough. Transfer dough to parchment paper. Press out to about 1/2 inch. Make into a rough rectangular shape. Using a pastry scraper, knife, spatula or other edge, cut dough into squares about 1 1/2 inches across. You do not need to move the dough after cutting. Alternately, use a biscuit cutter to cut out rounds. Place them close together on the parchment. Press remaining dough together and repeat. Put cookie sheet in oven and bake for about 12 minutes, until tops of biscuits are slightly browned. Take the biscuits out of the oven and brush the tops of the biscuits with butter, sprinkle with sea salt and fresh pepper, then return them to the oven. Bake about 5 more minutes. Remove from oven and let rest a few minutes. I have a narrow window when it comes to bananas that are ripe enough but not too ripe. And I eat a banana almost every day. This means two things. (1) I make frequent trips to the grocery store and bananas are always on my list. Always. Literally. I use a grocery list app on my phone and never clear bananas from the list. This weekend I decided to try making Banana Buttermilk Biscuits. It was inspired by this one from Dine and Dish, but I made a few modifications based on the ingredients I had on hand and my hope to punch up the flavors a bit. I particularly thought more vanilla flavor and banana would be nice. I did not see a lot of options when it came to banana biscuits, so decided to go with this one and just vary a couple of things slightly. This dough was really sticky! I did not end up putting in more banana, which was just as well. I don’t think I would have had any luck cutting out the biscuits if I had. I did add more vanilla. I also decided that I needed to add a variation. Since I am partial to the combination of Nutella and bananas, I went with that. I thought I should freeze the Nutella to make chunks of it, but I had read that Nutella does not freeze well. Perhaps because I was -ahem- using on off-brand, I had no trouble getting thin, frozen, little sheets of it. I layered these with the dough right before cutting it out. I have to say that these surprised me a bit. I had guessed that the Nutella variation would be my favorite, but found myself partial to the plain banana biscuit. Well, plain with honey butter! Because everything is better with honey butter! I made the biscuits huge so they were moist and fluffy inside with just enough banana flavor to enhance the buttermilk biscuit flavor. Bottom line is that they were wonderful and you should go make them. Now. Go ahead. I’ll wait. Ahhh, these leftovers got special treatment. 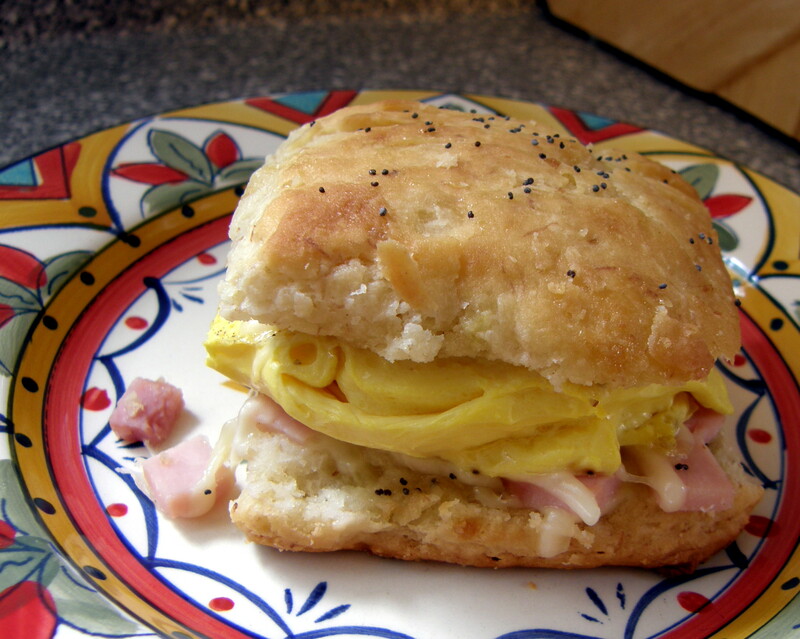 So special that I will be dedicating a whole post to what became The Best Biscuit Sandwich Ever. Stay tuned! Add Crisco to dry ingredients and rub with your fingers to make the Crisco break up into small, pea sized pieces. Make a well in the center of the dry ingredients and add the buttermilk mixture. Mix quickly with large spoon or hands, turning bowl and gently scooping the dry ingredients into the wet. Add more buttermilk, if needed, to make dough moist but not too wet. It will be somewhat sticky. Transfer dough to parchment paper. Press out to about 1/2 inch. Make into a rough rectangular shape. Using a pastry scraper, knife, spatula or other edge, cut dough into squares about 1 1/2 inches across. You do not need to move the dough after cutting. Put cookie sheet in oven and bake for about 15 minutes, until tops of biscuits are slightly browned. If you wish, take the biscuits out of the oven a couple of minutes before they are done and brush the tops of the biscuits with butter, then return them to the oven. Use 1/4 cup or more of Nutella, depending on whether you are using a full or partial batch of the biscuits. Spread thin sheet of Nutella onto wax paper and put into freezer for at least one hour before you begin making the biscuits. Fold dough towards the middle, like a letter folder into thirds. Transfer to cookie sheet, flatten dough slightly, and cut into squares.